Last week saw me driving up to Queensland for the first time in 2014. For a change of pace I went up the inland via the New England Highway. In years gone by this was normally an added hour so to the coast road, however with all the new bypasses it took quite some hours longer. I’ll continue to use the coast from now on I think. Monday afternoon I started off in the west of Brisbane, helpful as that’s where I was coming in from and then went on to a new retail outlet in Brisbane’s east which opened late last year. Tuesday was spent doing the rounds of the outlets around the Brisbane area and then heading off to the Sunshine Coast. There are a couple of builders finishing off a couple of large Schionning catamarans, these both looked pretty good only a month or so out from launch. Both of these builders have another to follow which is good for the local employment. The Sunshine Coast area is developing quite quickly and has certainly changed since I first went up there in the mid 70s. It’s no longer a spread out area, all the bush and farm land is being developed at a rate. I then headed south to the Gold Coast, again this area is being built quite rapidly with the upcoming Commonwealth Games. There’s also a light rail/tram railway being built. When I compare the developments in these areas and the total lack of new infrastructure in my local area, it has to make you think. Sydney’s main roads out of the CBD are 2 lanes each way, up north they are 4! Melbourne too has some new freeways and toll roads heading out of town. Following the week of doing the rounds of the various outlets, boat builders and sailmakers, I then changed my times forward to NSW daylight saving time and stopped off in Ballina. Again catching up with a boatbuilder there, it’s always nice when they come to the DeckHardware van and purchase on the spot. From Ballina it was down to the Big River Sailing Club at Harwood for another visit. In the past I’ve enjoyed the hospitality of the Northern locals and in turn they appreciate having the van there with a few bits and pieces. This time however I was offered a spot on boat an I550, a little sportsboat built at Ballina. On the last visits, these little boats have inspired me and to have the chance to go for a sail on one, let alone a 2.5hr race, well.. What a hoot, just crack the sheets a little and they are off on the plane like a dinghy. I haven’t had a grin like that since we had Animus up and surfing. I can now see why there’s the eighth boat in the mould and nearly ready to come out. For a change of pace, I’m heading off to Jindabyne for this weekend. I’ll be running a race officers course as well as the Inaugural Snowy Mountains Regatta. This is catered for the locals who sail a variety of dinghies, cats and small sportboat/trailerables on Lake Jindabyne, they are also hoping for a few of the Canberra locals to come down. The lake is the result of the Snowy Mountains hydro-electric scheme providing power to the South-east of Australia. It’s several times the size of Sydney Harbour so there should be plenty of room, not too much traffic apart from fishermen either. I haven’t been down there for several decades as I’m not a snow person [I’d rather sail], needless to say I have packed for all weather conditions bar snow. Should be interesting, I hope we get some breeze. After a couple of weeks back home and in the office, it’s off to Queensland for the first time this year. I’ll be spending the week on the Gold and Sunshine Coasts as well as the Brisbane waterside suburbs. 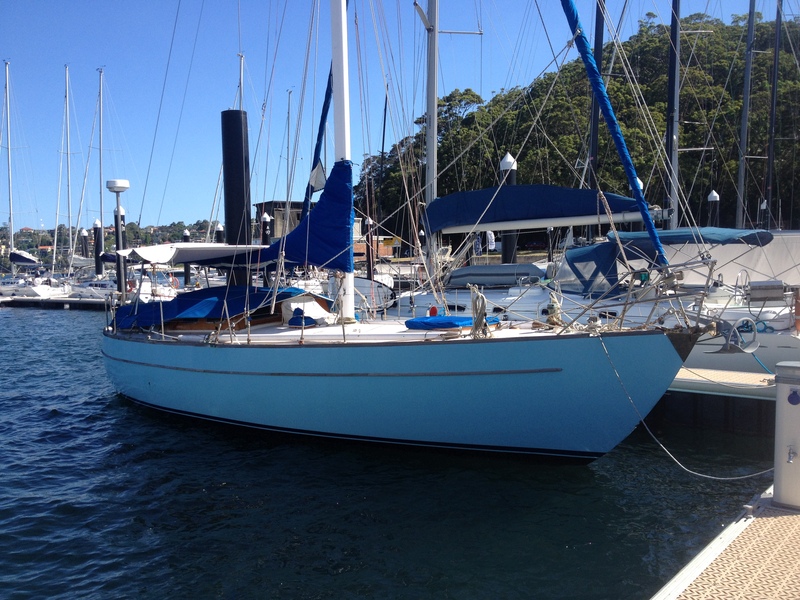 Whilst at Middle Harbour Yacht Club the other day, I came across Tawarri a Swanson42 that I did my first ‘offshore regatta’ on, the RSYS Squadron Cruise back in the early70s. A solidly built cruiser,as they all were in those days, it was interesting seeing her up close again. Certainly brought back memories of my first time at Wangi Wangi. Tomorrow I’m off to the Sabots at Abbotsford, a continuation of DeckHardware’s support of the class National Championships earlier this year. Haven’t been there by road for a number of years, being the upper harbour we race up there once a year in the annual Chaos Cup, so called because it goes to Bedlam Point. Next weekend on my way south from doing the rounds in southern Queensland, I’m stopping by the Big River Sailing Club at Harwood where I was last in November. They are having another regatta, I’m looking forward to seeing some of the locals again, one of whom I went to school with. Once again I’ll have the DeckHardware regatta support van there. In the coming weeks, I’m off to Jindabyne to run a race officers course and a two day regatta, Middle Harbour Yacht Clubs Sydney Harbour Regatta where I’ll be offshore with the IRC boats. Following these are the Melges32 and 420 events at MHYC.